Enjoy first-class seats to the Passion Play in Oberammergau in 2020.
it’s a magnificent experience in Globus style! Germany is a country filled with spectacular scenery, medieval towns, fairytale castles, a fascinating history, and world-class beer. On this Germany tour, see Germany's highlights and visit its most famous cities, medieval towns, and scenic areas. Your vacation begins and ends in Frankfurt with overnights also in Cologne, Berlin, Dresden, Nuremberg, Munich, Oberammergau, and the Black Forest. You'll visit the must-see attractions in each city, including Cologne’s famous gothic cathedral, with its twin-steepled towers, and Berlin’s Kaiser Wilhelm Memorial Church, badly damaged during the war and today a symbol of reconciliation. Magnificent scenery also awaits you on this Germany vacation. Enjoy a Rhine cruise along the Rhine River’s most scenic section, with castle-crested hills, terraced vineyards, and pretty wine towns. Visit King Ludwig II's Neuschwanstein Castle, nestled high in the Alps. Drive on the panoramic German Alpine Road to beautiful Lake Constance, Europe's largest freshwater reservoir, and to the charming island of Lindau. Stop in Rothenburg, a walled town that has retained its medieval character, and enjoy Germany's lush Black Forest region, where you’ll learn about woodcarving and enjoy coffee and Black Forest Cake—a special experience included by Globus. A tour to Germany would not be complete without sampling the local cuisine and beer. That's why Globus has included a beer at a famous brewery in Cologne, founded over 100 years ago. Bratwurst has been a tradition in Nuremberg for many centuries, and Globus has included dinner at a local Nuremberg restaurant to taste the traditional Nürnberger Bratwürste. But that’s not all…Globus has included first-class seats to the Passion Play in Oberammergau. From the beautiful scenery and exciting cities to the traditional food and wonderful beer, this Germany tour has it all! Time to rest or to start exploring the bustling metropolis on the Main River. At 6 pm, meet your Tour Director and traveling companions and leave the hotel for a special welcome dinner at a local restaurant. A special treat at the very start of your journey through Germany is a romantic RHINE CRUISE along the most scenic section of the Rhine River, with castle-crested hills, terraced vineyards, pretty wine towns, and the Lorelei rock. Disembark and drive to Cologne to visit the awesome gothic CATHEDRAL. Its twin 515-foot towers, five naves, splendid stained-glass windows, and the shrine of the Three Holy Kings are eloquent testimony to the quality of medieval engineering and craftsmanship. Afterwards, enjoy a beer at the Cölner Hofbräu Früh, one of Cologne’s famous breweries. 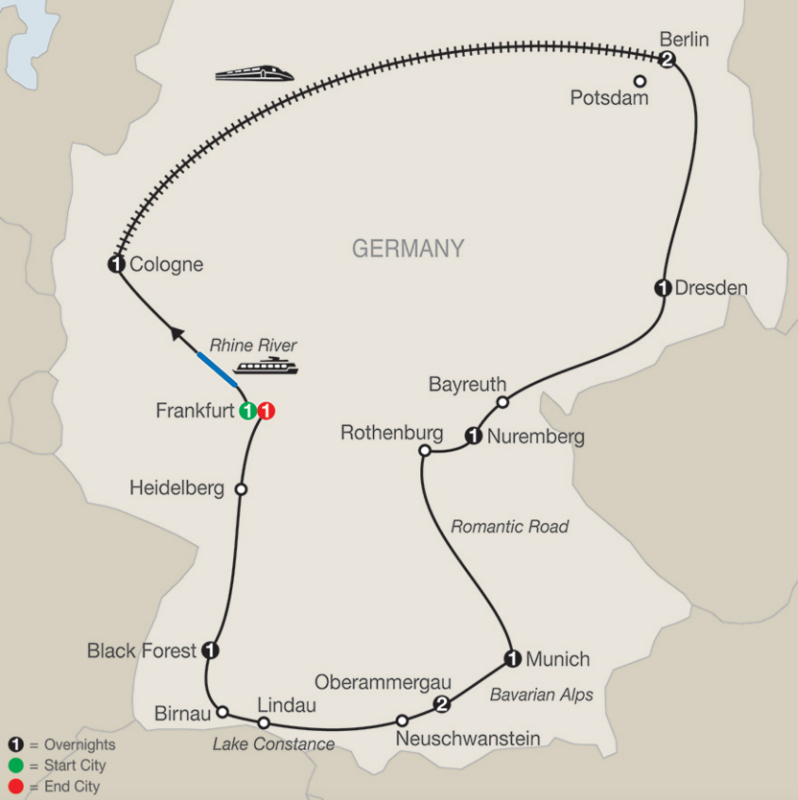 Ride the ICE TRAIN to Berlin, capital of reunited Germany, where sightseeing with a Local Guide in the once-divided metropolis includes the elegant Ku’damm, the restored Reichstag, Charlottenburg Palace, a picture stop at monumental Brandenburg Gate and the Holocaust Memorial, and the 210-foot Victory Column in the vast Tiergarten park. Visit the KAISER WILHELM MEMORIAL CHURCH with its bomb-damaged tower, drive along Unter den Linden boulevard, and pass the State Opera House and Checkpoint Charlie. A full day at leisure gives you a chance to join one of our exciting optional excursions, like to nearby Potsdam. Arrive in Dresden, former capital of Saxony. Badly damaged by Allied bombing in February 1945, the city has since been restored to its baroque splendor. During your orientation, see the Zwinger Palace COURTYARD to admire its impressive architecture; the magnificent baroque Semper Opera, originally built in 1841, once destroyed by fire, then destroyed by bombing, and finally restored in 1985; and the newly rebuilt Frauenkirche. Stop in Bayreuth for an orientation of this city, of festival fame. Richard Wagner came to Bayreuth in 1871 and was not satisfied with the existing 18th-century theater, the Markgräfliches Opernhaus, so he had a new one built. Today, the Festival Hall is used exclusively for the Bayreuth Festival, and only works by Wagner are performed there. Continue to Nuremberg, the town of children’s toys and gingerbread. Admire the impressive medieval ramparts and walk through the pedestrian area of the charming Old Town to St. Sebald Church, painstakingly reconstructed as a monument to peace from the rubble of near-total wartime destruction, and admire the Schöner Brunnen, a 14th-century fountain dedicated to the Holy Roman Empire. It is said that it brings good luck to spin the two brass rings. Then, have dinner at Bratwurst Röslein restaurant to taste the traditional Nürnberger Bratwürste. In medieval Rothenburg, admire its ramparts and towers, cobblestone lanes, and 16th-century houses during your walking tour. Hear how the town survived the Thirty Years’ War, and shop for Christmas ornaments, for which this pretty town is famous. Next is the Bavarian capital, Munich. Tonight, you may wish to join an exciting optional dinner outing. Sightseeing with a Local Guide of Germany’s “Secret Capital” features the Olympic Stadium, built for the 1972 Olympics; the 1,000-foot-high Olympic Tower; and Königsplatz, used for Nazi rallies during World War II. Drive along the Ludwigstrasse, and see the Bavarian Arch of Triumph and Field Marshall Hall. Also visit lively MARIENPLATZ with the Old and the New Town Halls and the gothic Frauenkirche. In the late afternoon, drive to the romantic Passion Play town of Oberammergau, where you will stay for the next two nights. Afternoon and evening are dedicated to the world-famous PASSION PLAY. Start today with a visit to King Ludwig’s magnificent NEUSCHWANSTEIN CASTLE, which inspired Walt Disney. Follow your Local Guide through this fairytale castle on its craggy outcrop high above a sparkling lake. Then, continue along the panoramic German Alpine Road to the sunny northern shore of Lake Constance, Europe’s largest freshwater reservoir. Visit the charming island of Lindau and the baroque CHURCH at Birnau before entering the lush Black Forest for your overnight stay. This morning, drive deeper into the Black Forest, then stop for a WOODCARVING DEMONSTRATION and Kaffee und Schwarzwaldkuchen (coffee and Black Forest Cake). Arrive in Heidelberg, Germany’s oldest university town, of Student Prince fame. Time to stroll around in the Old Town, then ride the FUNICULAR up the hill and visit the red-walled CASTLE where the GREAT VAT, a 58,000-gallon 18th-century wine cask, attracts particular attention. Return to Frankfurt, where a farewell dinner has been prepared to say auf Wiedersehen!